John “Jackie” “Johnny” H. Lamb, Jr., 76, formerly of Coatesville, died surrounded by family on Monday, February 11th, 2019. He was the husband of Joan Gay Lamb with whom he shared 56 years of marriage. Born in Coatesville, he was the son of the late John and Vivian Rehm Lamb, Sr. John was the owner of John Lamb & Son until his retirement in 2006. He was a member of St. Cecilia’s Roman Catholic Church and renewed his vows with his wife, Joan, at Our Lady of the Rosary Church in 2012. He enjoyed many annual trips to his family cabin in Clinton County where he and his brother, Dave, would hunt. 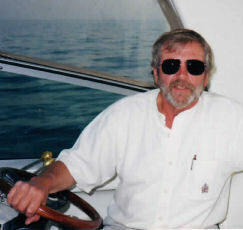 He also enjoyed fishing and boating on the Chesapeake, where he kept his boat. Surviving him are his sons, Mike (Barb); Scott (Laurie); Steve (Lynn); and 5 grandchildren, Mallory, Kyle, Adam, Sarah & Tim. A funeral Mass will be celebrated at 10:30 a.m., Saturday, February 16, 2019 at Our Lady of the Rosary Church, 80 S. 17th Avenue, Coatesville where relatives and friends may call from 9:15 to 10:15 a.m..